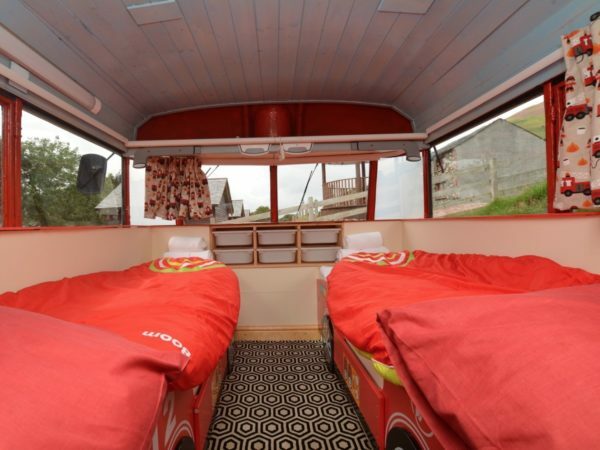 This is the Red Rescue Retreat Tiny Bus Cottage located in Keswick, United Kingdom. 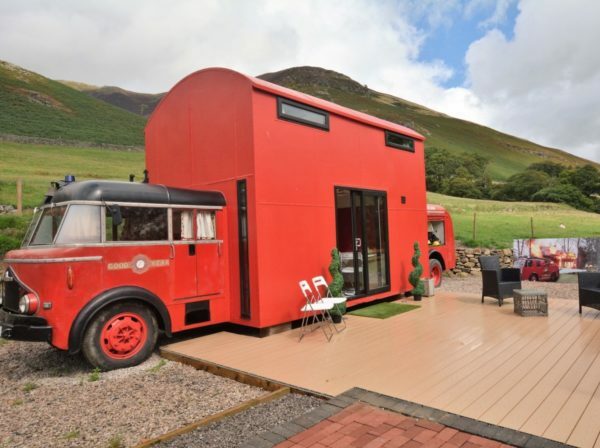 What used to be an old fire truck, is now a beautiful and one-of-a-kind vacation retreat with wonderful views of the Blencathra Fells. Entering the fire truck from the lovely decked patio area, into the fantastic open-plan unique accommodation with an array of quirky features including the firemans pole and replica tied ceiling cables. 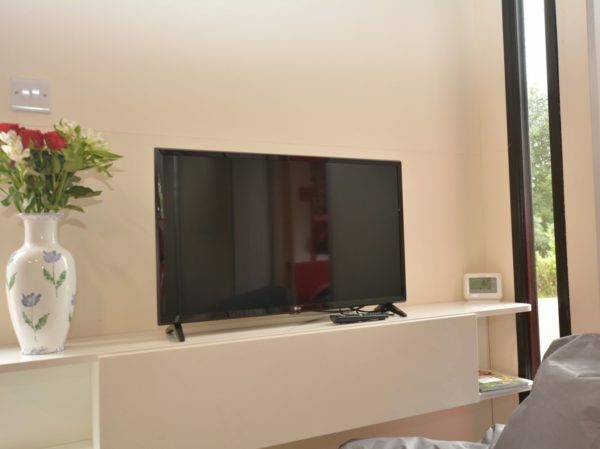 The lounge area with a Smart TV, comfortable sofa, that can convert into a double bed and large bean bags, is the ideal place to relax and perhaps watch a great movie, after a day out exploring the local area. The dining area has lovely views over the patio with ample seating, perfect to enjoy family or romantic meals together. 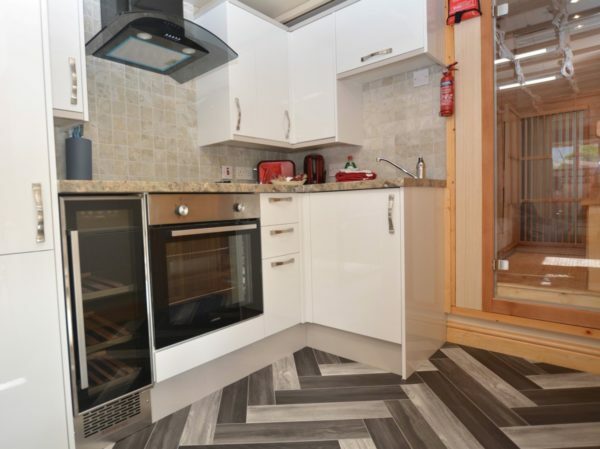 The kitchen is well-equipped with electric oven and hob, plenty of storage space, drop down table and wine cooler/fridge. 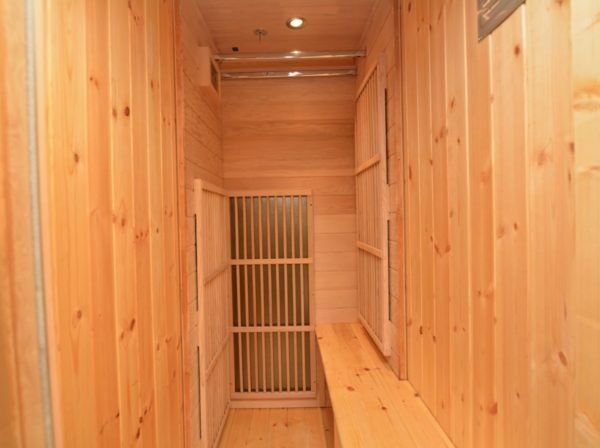 Next is the fantastic sauna room with glass door. 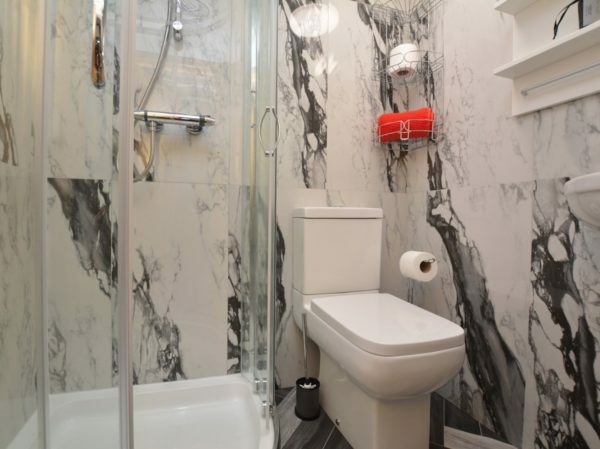 Followed by the lovely shower room with shower and WC. 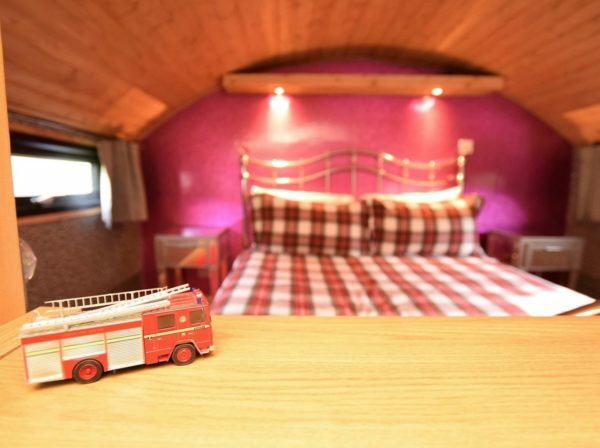 Completing the ground floor is the wonderful kids twin bedroom, with fantastic fire engine bedsteads and funky sleeping bags (please note they are only suitable for children up to the of age of 12 years). 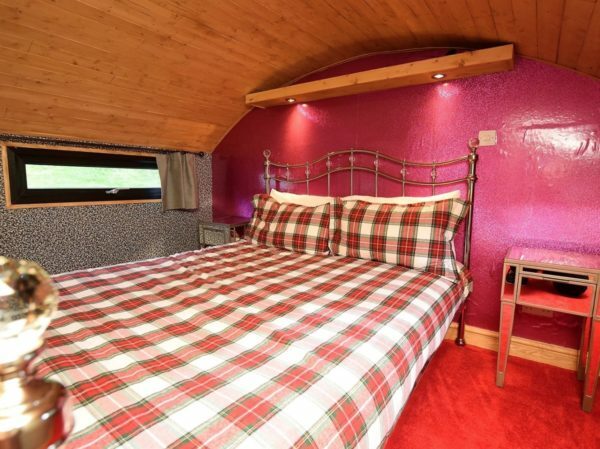 Heading up the ladder, you will find the spacious master bedroom, with lovely comfy king-size bed, TV, dressing table and the gated lockable fireman’s pole. So am the first comment! 😀 Love this. I want that pole. This is beautiful inside and out. Perfectly designed. Nothing that I don’t like. 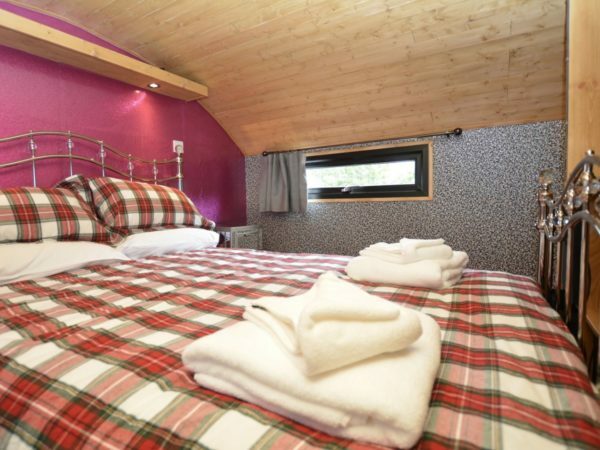 The beds are so cool. The deck and table is inviting. Now I will go eat some lunch. 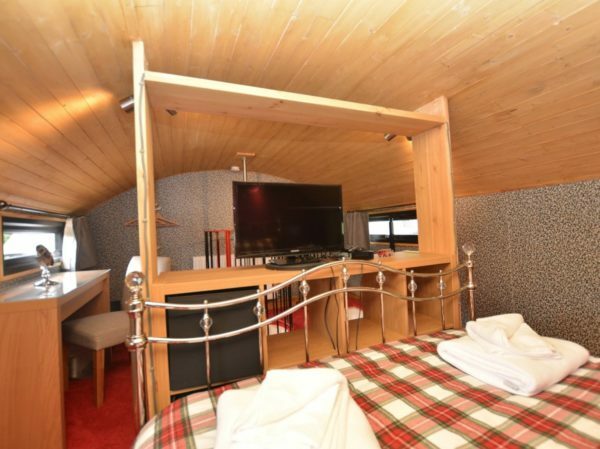 Top floor looks like a death trap – in case of fire. The windows do not look like one can get out of them – too narrow, unless one is really skinny. I would definitely put in an emergency opening. Mind the height, it’s not exactly safe to just drop down to the ground when it’s that high… So the fire pole that drops you right down in front of the glass sliding doors will be a first choice of rapid egress. DPedersen, I have noticed that you seem unable to make a comment that isn’t a criticism in some way. There was a nice THoW in New Zealand which you claim is overpriced, maybe by the US market but normal for some other countries. This house is apparently a death trap unless you are lucky enough to be skinny. Both these comments have been levelled at other THoWs as well. If you can’t be nice or make a genuinely constructive remark then don’t say anything. 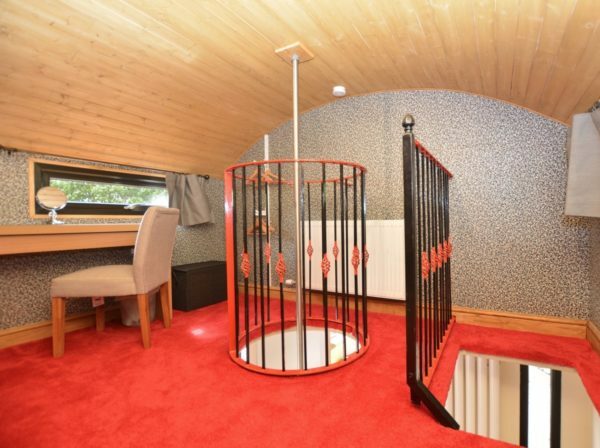 The UK has a high compliance requirement for living places, much higher than many countries, so I very much doubt this is a death trap foir anybody who isn’t skinny. If you must criticise try focussing on the fact that it seems every THoW has a big TV screen, and, especially in the US, a washer/dryer and AC unit. Neither are eco friendly and almost every THoW has all of the above. Unnecessary, expensive, wasting resources which the owners/builders claim to want to save, criticise them if you must. Otherwise your comments are your oiwn personal opinions unless backed up by the relevant govt laws or, price wise, examples of similar THoWs of the same standard in the same country for less $s. “Not from riches but from virtues born the beauty”, Socrate.